Why and how did you become interested in Calligraphy and Illumination? My interest in calligraphy and illumination started with maps. I’d been fascinated by maps and map making in secondary school, and did a geography degree to do cartography. I had a place on an MSc course in Glasgow but home circumstances meant that I couldn’t take this up. I went into business for a while and then teaching. I found a course at Reigate College of art that did calligraphy and that I could do part-time, while still teaching. The course also covered illumination, though I wasn’t too sure what that was, and heraldry, which I thought was a bit dated. However, I saw the gold and colour on day one and was completely hooked! I loved the course, the history, the skills and techniques which were so much like those in mediæval times, and determined to carry on when I finished. I’ve been very fortunate because I’ve never not been busy and I’ve never stopped absolutely loving what I do and sharing it with others. Where does Heraldry fit in to your work? Heraldry was part of my training and is still something that I am very interested in. It doesn’t come up very often in what I do but just occasionally someone wants their coat of arms painted, sometimes in combination with calligraphy. As I don’t work for the College of Arms I can also do the fun coats of arms which people sometimes request – crossed champagne bottles and golf clubs with a sports car or diamond necklace! I feel it is a real privilege to write in the names of these children who have not been able to reach maturity, and so ensure that they are recorded and remembered in this way. I recently worked with the Woodland Trust to produce their ‘Charter for Trees, Woods and People’ to mark the Charter of the Forest of 1217. This meant having to write out quite a lot of text about the value of trees and woods, and also incorporate designs of trees selected by the Trust. It was a challenge but a most enjoyable one. Quite a challenge too was working on vellum for Damien Hirst’s exhibition in Venice, ‘Treasures from the Wreck of the Unbelievable’. There were 100 exhibits and each one had been drawn on vellum three times. I had to annotate these in seven different writing styles as though phrases and notes had been added by different people through the centuries. Are you currently working on something that you can tell us about? What are the benefits of being involved with this kind of craft especially as we enter our Third Age? 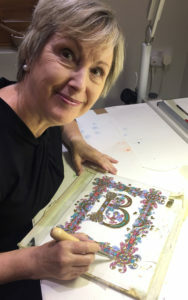 In my own craft, it involves such intense concentration that all worries and concerns are left at the door of my workroom for a few hours while I focus on the best design, the most appropriate colours and the complete satisfaction of executing a flourish that really enhances a letter. And the pleasure that it gives me, and I hope other people, brings joy to the soul. For those in the Third Age, the benefits of keeping busy, having a focus, and using your hands and brain together keep both active. And going to classes to learn, practice and perfect crafts means that there is the added bonus of developing friendships and meeting other people. How important is it to preserve these crafts and trades and what tips would you give any U3A member thinking of setting up a illumination or Calligraphy group? The importance of passing on the skills of our heritage crafts is as important as preserving a significant historical building – they are all part of our rich cultural heritage. Whereas there is a focus on ensuring that our castles, stately homes and important buildings and monuments are looked after, there is not the same concern to ensure that the craft skills that made those buildings, and the objects that went into them, is similarly looked after. The Heritage Crafts Association produced the Red List of Endangered Crafts (https://heritagecrafts.org.uk/redlist/) in 2016 and will be announcing the updates in March this year. In some crafts there are only one or two people practising the skills, and there is no central funding to ensure that trainees continue the crafts. I have free Calligraphy Clips on my website (http://www.patricialovett.com/) which may help if a tutor isn’t available, and it could be fun to learn together as there’s everything in the Clips to help anyone who wants to start or improve their calligraphy. What new thing did you learn most recently? 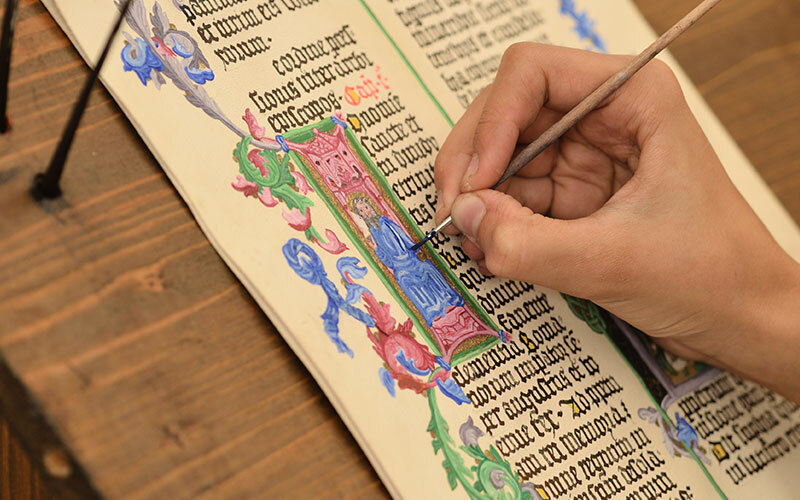 I learned most recently exactly how long it took to create a medieval illuminated page. As part of the British Library Polonsky Project we agreed that I would copy a page for it to be filmed. We looked at various options and the one we came up with was quite complicated, but I do like a challenge – however, I didn’t quite realise what a challenge it would be! I knew that those early illuminators were supreme practitioners, but hadn’t quite realised exactly how much! It took me about three weeks to copy the page – which didn’t include the creating the original very complicated design – and this was just one page amongst many. When you are retired do you want to join U3A? At the moment I am pretty much more than full time being a scribe and illuminator and also being Chair of the Heritage Crafts Association. I have spoken at a number of U3A events and for local groups so have some idea of how wonderful an organisation it is and the work it does. When I am less busy it is definitely my aim to join so that I can make a contribution.